Six exceptional individuals have been inducted into the Canadian Medical Hall of Fame in 2018 — and one of them is Microbiome Insights’ co-founder Dr. B. Brett Finlay, University of British Columbia Professor of Biochemistry and Molecular Biology at the Faculty of Medicine, and Peter Wall Distinguished Professor at the Michael Smith Laboratories. The honour recognizes contributions to medicine and the health sciences that have had an extraordinary impact on human health. Below, we share a conversation with this esteemed member of our team — covering his career accomplishments and what he sees as the future of medicine. Over the years, you must have overcome many challenges. What has driven you to do the things you’ve done in science and medicine? I have always loved science, and the idea of using science to improve the world, including peoples’ lives, has always been a driving factor for me. Of course there are challenges, but as scientists we have the privilege to explore an exciting frontier, and find things never found before. Of course there are challenges, but all things worth doing have them, and being able to do science that has the potential to change the world is the greatest gift a scientist can have. In your long and broad-ranging career, what medicine-related accomplishment or recognition are you most proud of? The neat thing about science is you never know where it will take you. We are fortunate to have many successes. Some of the highlights include developing a vaccine to E. coli O157, developing the first SARS vaccine, and showing the early life microbiome plays a role in determining asthma are but a few. 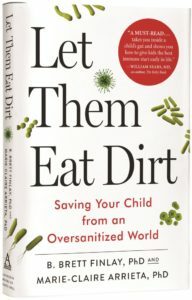 I am also proud of the book I co-wrote, Let Them Eat Dirt, and the new one I am finishing, The Whole Body Microbiome: Healthy aging with your microbes. This has allowed us to share the wonder and excitement of the microbiome with so many people. It is also changing how they look after their children with healthy benefits, which excites me tremendously, being able to promote child health through science education. How do you think medicine is changing now? I am biased, but I think medicine is about to undergo a profound change. Genomics, personalized medicine, and the microbiome will all play a major role in this upheaval. The ability to sequence a person’s genome or microbiome, to do a metabolomic analysis of a person’s urine, or a proteomic analysis of they blood all provide wonderful new tools to really figure out what is going on in a person, and then hopefully be able to treat based on molecular knowledge. The development of Crispr-Cas 9 could easily revolutionize gene therapy as well. What innovations or directions in medicine do you see as uniquely Canadian? Canada hits above its weight in science [but] science is global, and builds upon the shoulders of others, so to claim a geographic specialty is difficult. Canadian scientists are involved in many of the groundbreaking findings worldwide. How do you hope your own work will lay the foundation for a different kind of medicine in future? I strongly believe the microbiome will radically change medicine. If you take the top 10 reasons Canadians die, 9 of those 10 now have microbial links. Similarly, we know the microbiome plays a profound role in how our body develops early in life. There are so many areas of medicine the microbiome is impacting, the inside joke is “what area isn’t affected”! The other advantage of the microbiome is that we can change it easily, unlike our own genes. This means its application should be easier than gene therapy or developing drugs — drugging the “bugs” will be a whole new area of pharmacy in the future. 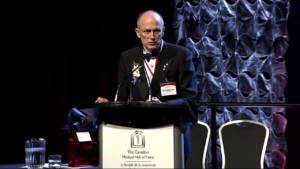 The 2018 Canadian Medical Hall of Fame (CMHF) induction ceremony was held on April 12, 2018, in London, Ontario (Canada). See the CMHF video of Dr. Finlay here. MAY 30, 2015 — Microbiome Insights, Inc. is pleased to announce the members of its inaugural Board of Directors (BOD). The members bring with them a wealth of knowledge from the global life sciences industry. Each one has achieved success in academic and/or industry roles and has contributed to groundbreaking advancements in their respective disciplines. Pieter Cullis, PhD, Director at the Life Sciences Institute, University of British Columbia. Dr. Pieter Cullis brings decades of experience in research and business. He is, along with his colleagues in academia, responsible for many fundamental advances in the field of lipid nanoparticle systems for intravenous delivery of small molecule and macromolecular drugs. This work has led to three products which have been approved by regulatory agencies in the US and Europe, and a further five that have finished Phase 1 trials. Outside of his academic achievements, Dr. Cullis co-founded several biotech companies and has received many distinguished awards, including election to the Royal Society of Canada in 2004. Dr. Brad Popovich has long been involved with Genome BC, serving on its Board of Directors from 2006-2011 and acting as the Chair for the Scientific Committee from 2008-2010. Alongside his current roles with Genome BC he serves as Chairman for the Genetic Information Management Systems and Director of the Centre for Drug Research and Development Ventures and Centre for Drug Development. His genetics expertise is in genetic counselling; he graduated with Masters degrees in genetic counselling and biochemical genetics, and was awarded a PhD in molecular genetics from McGill University. He also received postdoctoral training and a clinical fellowship in the lab of Nobel Laureate Oliver Smithies. Throughout his career, Dr. Popvich has held many titles as Director, Vice-President, and CEO of numerous companies and academic institutions—including founder and director of the Molecular Diagnostics Laboratory at Oregon Health Sciences University and founding member of the Oregon DNA Forensic Experts Panel. Mike Fannon, Founder and CEO of BioIT Solutions. Mike Fannon currently advises new biotechnology firms in the areas of information technology and customer relationship management, business strategy, and laboratory automation. He is CEO of BioIT solutions, a leading company specializing in advanced computational, workflow, and data-management systems for clinical diagnostics, drug development, and biotechnology research. He was the chief architect of BioIT’s innovative 1Platform4 software and was the former Vice President and Chief Information Officer at Human Genome Sciences, where he and his team developed computerized solutions to manage Human Genome Sciences’ R&D functions, high-volume labs, product development, and clinical trials. Mr. Fannon holds an MBA in Operations Analysis from American University and a Bachelors degree in Physics from Rollins College.